Learning Italian must be - first of all – fun and enjoyable, but successful results come only from your personal effort. Each course level (Beginner A1 – Elementary A2 – Intermediate B – Advanced C ) lasts an average of 32 hours, depending on the number of students in a classroom. Each level is generally divided in two sessions of approximately 16 hour course: part 1 and part 2. If you find that you need extra time and more time to absorb what you have learnt you may want to consider to take extra private classes to catch up with the other student in the classroom or you can repeat the course. There is no rush nor competition, what’s important is that you need to feel comfortable with your pace of learning. Consider though, that the time you devote to study Italian at home is your investment (you can save a lot of money!) and the rewards will be immense! Be sure not to miss any classes. Class attendance is a key factor in your learning Italian. Coming to class on a regular basis allows you to 1) practice your oral and listening skills; 2) interact with the other students in Italian; 3) discuss and receive explanations about what you studied at home; and 4) improve your general proficiency in Italian. 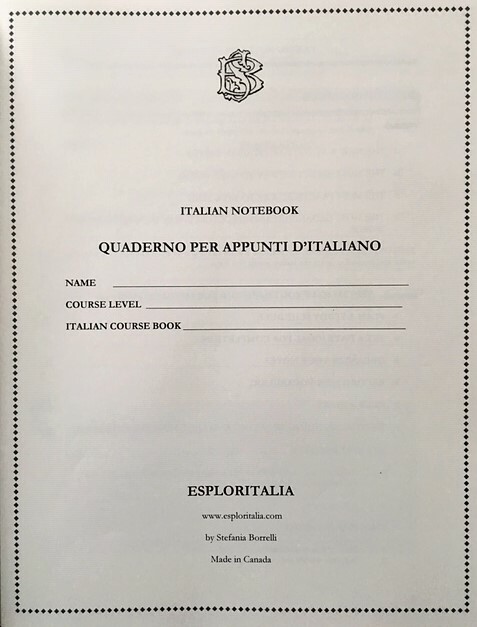 The course should be conducted in Italian only. 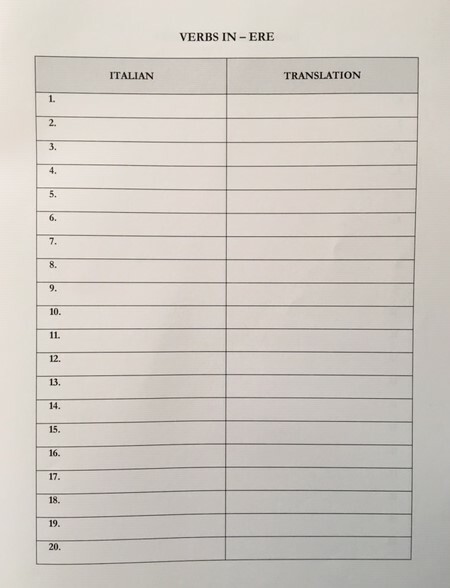 You are expected to speak only Italian during class time. The use of English or French will not help you learning Italian and will also adversely affect your learning. Italian language teachers in Italy ONLY teach in Italian: teaching in English or French is absolutely forbitten. You will be guided through a variety of activities that will expose you to a rich input of Italian and allow you to develop your language abilities through interaction. Language Acquisition requires a steady, constant, daily and weekly effort. I encourage you to prepare in advance for the materials that will be covered in class. Translate in your language the new vocabulary of the next unit of the textbook and fill your personal glossary in a notebook in alphabetical order and / or according to the categories of verbs, nouns, adjectives, etc. When you don’t remember a word and you want to search it in your notebook, you know exactly where to find it. You are expected to come to class with a certain amount of knowledge on the points being addressed, so that we can move quickly to the classroom activities that will help you reach our interaction and communicative goals. Please remember that a considerable amount of your language acquisition will happen outside of the classroom. Ideally, you should spend at least 3-4 hours per week or 30 minutes per day practicing Italian outside of the classroom. You are expected to study and practice grammar and vocabulary; complete homework; and use Italian in a variety of meaningful contexts. Your daily preparation is crucial to the success of your learning process in the classroom. In other words, your progress in the course is a direct result of the amount of time and effort you invest in learning and practicing Italian. Find the right notebook for you. 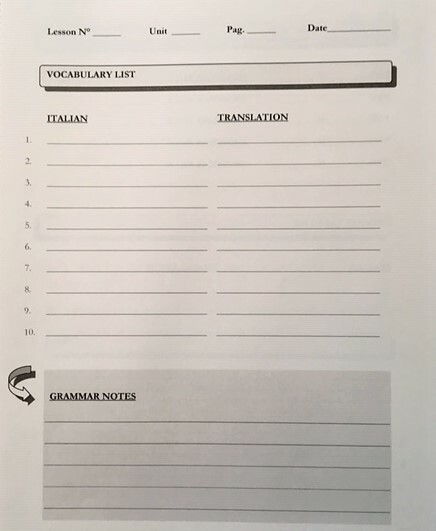 Divide your notebook into sections: vocabulary lists, grammar , writing, etc… Divide the grammar section in : verbs, adjectives, prepositions, nouns, etc, in this way it will be easier to find the words you search for when you need. SPEAK ITALIAN EVERY DAY, EVERYWHERE ! There are many videos YouTube to practice and improve Italian ! There are also many websites which explain the Italian grammar in English or French, as well as many exercises on-line to practice. When you read at home, read out loud. Then re-read and speed up your tempo. Do this again and again until you can speak faster. Reading and speaking aloud helps to train the muscles of your mouth and diaphragm to produce unfamiliar words and sounds. Most learners run out of things to say during the class. But, if you prepare lines ahead of time, you won’t be at a loss for words in conversations. This will help you not only to learn how to say the words, but how to say them in the right context. Before attending the class prepare how to ask the most common conversational questions, and how to answer them . Make a list of questions you may be asked by your teacher weekly, regarding the specific Lesson Unit from the textbook and prepare the answers.